Home » blog » Mad Mod Quilt Guild 2018 Sewing Retreat – You going? How would you like to spend a whole weekend with your fellow quilt guild peeps? 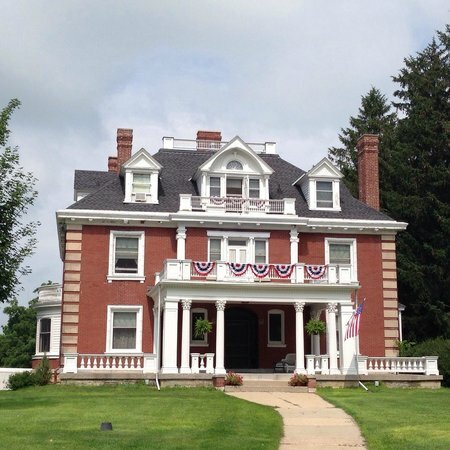 Get away from it all and meet up at the Jones Mansion in Mineral Point Wisconsin for our second guild sewing retreat. Check out all the fun we had last time! Check-in is at 5 p.m. and there is a 4 guest minimum. Check in at 11 a.m. Please include the date of the retreat and “MadModQuiltGuild” with your check. The beautiful Jones Mansion caters to crafters of all kinds for weekend retreats in Mineral Point, Wisconsin. There are accommodations for a maximum of 14 guests, and a minimum of 10 is required for a weekend retreat. Tables, chairs, ironing boards, irons, and cutting stations are provided. The sewing studio also has Ott Lights that offer great lighting. Guests provide their own meals. There is a full kitchen and dining room to make this a fun and social part of the weekend. There are also local restaurants within close distance for dine-in or take-out. Each guest gets a twin bed complete with cozy sheets and a handmade quilt. There are two private bedrooms, and the rest is shared between 2 or 3 guests. There are four full bathrooms. Questions? Check out the Jones Mansion website or email madmodquiltguild@gmail.com. We hope to see you there!